Those of you who read these posts [Part I Part II] know that my worldview of ecologically sustainable living, has, over the years veered towards cluster based human settlement – large metropolises or cities with shared infrastructure which reduces the ecological cost of living and that recent technological breakthroughs in Solar power, off-grid power storage, biodegradable materials etc have created a window for suburban sprawls also be become ecologically efficient lifestyles. But as we concluded in the previous post of this series, the biggest stumbling block in making suburban life sustainable is the real estate overhead claimed by it. Suburban sprawls, however energy efficient, do consume much larger space per-capita leaving less land available for food and related needs to serve the ever-burgeoning population of the world. The matter is further complicated by the rapid upward economic mobility of large populations in Asia and Africa. I wrote about two routes to manage these contrasting necessities - need to bring prosperous living to all human population and maintaining an ecological balance. I elaborate these two below. Route A - Stick to cities until we can move back to suburbs! 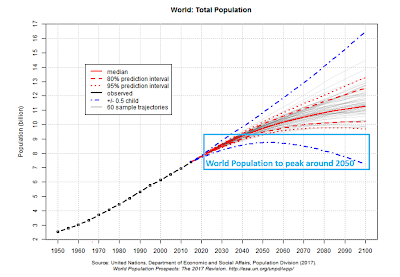 It is predicted that human population will peak to 9bn around 2050; then come down to today’s levels by end of this century. If we can keep walking on the fine line of ecological sustenance by then, the human population will possibly live in a healthy harmony on earth after this period. An illustration of this ‘sustainable life’ is available in parts of Europe where prosperous nations with low-density population aided largely by mechanised solutions are living a far more ecologically balanced lifestyle than cities and suburbs in Asia or even North America. It looks difficult however that almost 5bn Asian and African populations slowly maturing towards the lifestyle of the West, would wait for another century – these populations will want the comforts of a developed lifestyle faster and hence might put increasing pressure on our ecological systems. As is evident already with the environmental imbalances across the globe – this might spawn an ecological disaster far before world population peaks, plummeting human prosperity or even threatening human existence! In a best-case scenario, if we do continue to walk on the thin line between ecological disaster and providing comfort to populations in developing nations; the future, until population abates, lies in clustered living – even denser cities and metros rising vertically leaving larger swathes of land for agriculture and forests. Route B - Fly away! The other alternative, like Solar, electric cars and off-grid charging; is again being heralded by Elon Musk. 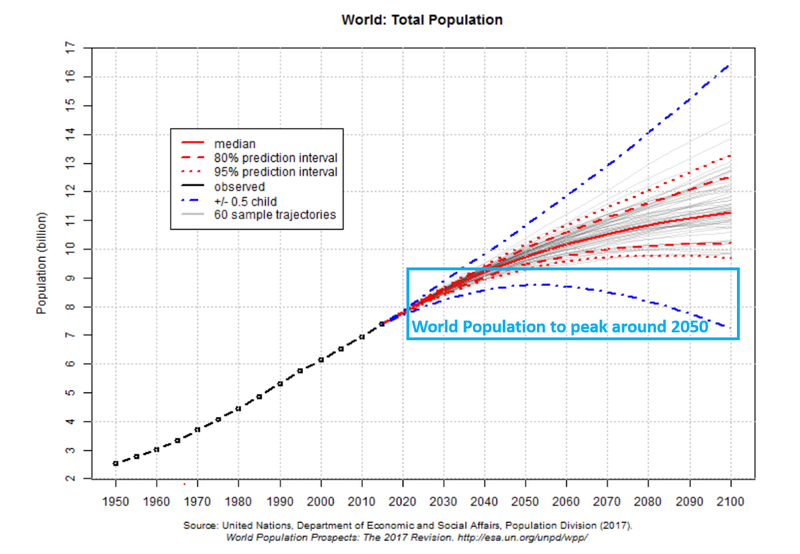 If we can’t reduce human population and we can’t prevent an ecological collapse with the rising population, the only option we have left is to create more real-estate. And what better than colonizing Mars to increase real estate. In fact, several innovations such as Solar Power, Electric Vehicles, even Tunnel based Hyper-Loop systems are a ready fit for a Martian colony. Humans could harness the power of the Sun to create a cocooned Martian ‘space’ station which would grow its own food, manage its own micro-sewage, and people could commute within the station with electric vehicles and between two stations through hyperloop tunnels. Are we there yet? Hell - no! However, we are racing against the ecological clock with both these alternatives; will mankind be able to set up a Martian colony before earth implodes with human population? Or will we be able to create enough cities while keeping the ecological cost of living under check to prevent imminent ecological collapse? Only time will tell – I just hope I can live long enough to see how the suspense ends! This essay is the last of a 3 part series - read Part I and Part II. As explained in my previous post, scientific research proves that cities are more sustainable for mankind to live - the characteristic compactness of cities, for example, lessens the pressure on ecological systems and enables resource consumption to be more efficient . This assumes that cities will be built to sustain the population load they bear through appropriate infrastructure including public transport, sewerage / eco-efficient waste disposal, provision of parks or other recreational habitats etc. Energy is a common cost underlying all four above costs in addition to other ecological costs they impose. Of course, these costs are directly proportional to the number of humans using these; but assuming we have little control over rising population of humans, the only way to manage ecological cost of human existence is to keep the per-capita ecological cost of the above as low as possible. Food can be transported in large trucks and trains for a large number of people; usage of trains or highway infrastructure can help bring down logistics costs; sorting and processing of food can also be centralised employing machines to the extent possible. Clustering humans in one place helps build efficient public transportation systems such as metros and bus services. This reduces the travel time but more importantly is much more efficient than guzzling cars running on large swathes of highways. This also frees up highways for movement of goods and the thus reduced traffic jams help in reducing fuel cost per unit of food or other goods required. Cities rather than large spread of suburbs helps in reducing the average length of the sewage canals from each home to the treatment facility. Large treatment facilities can also help in reducing the per unit treatment cost. Real estate – clustered living leaves large tracts of land open for – the obvious – agriculture! Rather than build a (farm) house on a quarter of farm land or allocate 10-15% of farm land for suburban sprawl, this land can be appropriated for agriculture or animal husbandry. Public transport is sparse or non-existent in suburbs, hence people are more likely to use personal vehicles and drive to their place of work (or recreation or school etc.) every day. The amount of fuel spent per person is quite high compared to what an equivalent office commute in public transport by a city-dweller. Suburban homes are bigger and energy required for their upkeep, ex. heating/ cooling power requirements are much higher for a two storey row-house compared to an apartment of the same size in the city. Maintaining the lawn in front or back of each row-house needs water and minerals. On the other hand, a common park is maintained in cities. The average size of the area needed to be irrigated or fertilised or manicured per person is much lower in cities. Add to it the fact that every inch of the lawn is an inch reduced from the pre-suburb forest or farm which occupied the place. However, in the last few years, several innovations such as Solar Power, electric cars and off-grid power solutions have challenged my well-researched position on sustainable living. And since my own childhood was spent growing up in a township in a row house with a garden around it, I tend to have an emotional attachment to such lifestyle. So, when innovations open up avenues to afford this lifestyle without the moral hazard (personally) and existential hazard (for the human race), I get thinking whether these innovations are indeed an panacea or we are missing something. Let us analyse the impact of some of the innovations on the above factors. Energy Production: Each of the 4 costs highlighted above need energy and until now, the only efficient way of producing energy (electrical or other forms) was through industrial means – large power plants whether thermals, gas fired, hydro-electric or nuclear. However, with the advent of Solar Power we now have a new method of power production – just capture solar power from your rooftop and power your house, your cars and even a small food processing unit in your backyard. In fact, Solar power is not practical for use in metros because the per person ‘roof space’ available in metros is far less than sprawling suburban row-houses. In addition, we have new ways of storing power - the revolutionary redox system - a fridge-sized box in your home not only generates and stores electricity on-site, but heats and cools the house, provides hot water and even churns out oxygen and hydrogen to use or sell. This adds on to the power of Solar power generation because now we can harness this power during the day and use it during the night time. Electric vehicles are a complimentary asset to ‘ecologically free’ energy. As the ecological cost of transporting humans comes down using ‘private vehicles’; one of the factors supporting public transport is taken away. No longer do cars pollute more than metro trains because all of them run on electricity. Cars from suburban homes would run on power produced from their own rooftops than a metro train which may still require a power plant to run because enough solar power isn’t produced from rooftops of tall buildings in cities. Waste treatment is an area which calls for more research – for example moving away from non-biodegradable waste in form of packaging and creating micro waste treatment solutions such as a recycle plant for kitchen waste and biogas solutions for sewerage might make local treatment of waste more efficient, thus making redundant the need for laying large sewerage canals from suburbs. This leaves 2 interconnected aspects – real estate consumption and food production. While suburbs can tout kitchen gardens and even animal husbandry in their backyard, these are clearly not as efficient as the amount of space a suburban home takes. If a 1000sqft apartment housing a family of four can be fed by a tract of land 500sqft, a suburban home of 5000sqft which houses approximately same number of people cannot produce all it needs in its backyard. And even if it does – the comparison’s still 5000sqft in a suburb to 1500sqft in a city to sustain a family of four. Yes, there are innovations such as vertical farming, micro- greenhouses – but these too target urban milieu more than the suburban. In balance, 'real estate' remains the most ardent roadblock in making suburban living as sustainable as the cluster lifestyle for humans. When I see through the lens of future on this problem; there are two potential solutions or rather routes I can see humanity evolving into. We will explore this in the next post. I grew up in a typical suburban home, single storied, lush garden around it. Whether it was the nostalgia of living that life or observation of lower cost of living in a small city, till recently I used to idolise that life, yearned to go back to it - until I started my research into sustainable living! Until I started researching on what "sustainable" living is, I used to assume that since the cost of living in a small city is lower, hence lifestyle there is less wasteful. And on the surface, it indeed was so in India, until a few years back. Until 2010s, most small cities did not have huge malls - the usual evening hangout would be a park or a single screen theatre; roads were much less crowded and small cars would outnumber guzzlers (SUVs) by a quadruple if not more; people bought fruits & vegetables from small shops who'd get supplied by local farmers. Metros or big cities, in contrast, had big malls, roads were clogged - one wasted more fuel idling at the traffic signal than driving around, SUVs & Sedans were more common; you'd buy daily grocery and vegetables from the supermarket where everything was packed with 3 layers of plastic etc. Other utilities like sewage management were bad in both small and big cities, but big cities generated much more garbage than smaller ones where people's habits (due to a lower standard of living) were less wasteful. Extending the same analogy between small cities vs. rural landscape - poverty and proximity to 'traditional' or agrarian lifestyle made village life look more sustainable or less wasteful. However, two things changed circa 2010 - first, the govt started recognising that India was urbanising and govt programs started targeting upgradation of urban infrastructure. And given that govt schemes were based on population statistics, Metros got a much higher share of this spending. Second, incomes started taking quantum jumps in India, and people across the spectrum - villages, small cities and metros - started spending more money on luxuries. Malls mushroomed in Tier 2 cities, SUVs followed soon, poorer villages started seeing two-wheelers and prosperous ones upgraded to four wheelers (even if they were second hand used cars from the nearby town). Thus as metros started getting better sanitation, better public transport (Ex. Metro trains), life became (comparatively) less wasteful while small towns and villages started spending more, but lacked the ability to deal with the environmental consequences (more plastic waste, vehicular pollution or traffic jams, sewage) generated from this spending. Parallel to this shift in India's landscape, my own study on the concept of sustainable living continued. Many articles, papers and solo thinking sessions later, (about 3 years ago) I converted to believing that a life in the city is more sustainable because a city promotes clustering and clustering reduces the amount of waste per person. 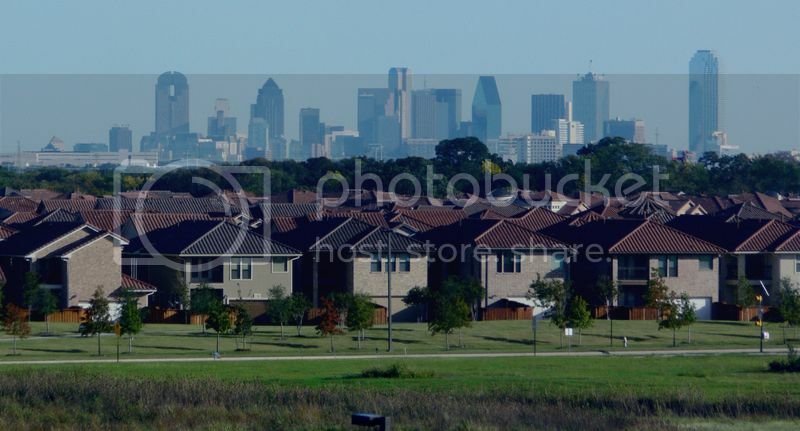 Studies on American suburbs suggest that cost of laying drainage, sewage and even electric and road connections to individual houses or even a cluster of row-houses in suburbs is much higher on the economy and ecology than wiring / sewering up a 30 storied building in the dense city. Add to it virtual death of the personal transport thanks to dense tube/metro networks which inhabit developed cities like London, the city (especially clusterized metro city) is a far more sustainable habitat for humans. A major positive side-effect a vertically built dense city infrastructure is that large swaths of land can be freed for vegetation and animals. Plus within the city, we can build gardens which can be maintained at a much lesser cost per person, unlike the suburban home where each one must maintain their own manicured lawn and tend to their plants. I live in one such locality in Mumbai and can bet that my lifestyle is greatly enhanced by living in a cluster than if I have a row-house in a far away suburb of Navi Mumbai or a small city like Baroda or Indore. In short, from a kid who revels and defends the suburban lifestyle he grew up in, I was almost converted to a city (metro) dweller who vouches for more people to move to cities and metros and leave alone the countryside for the few humans who engage in Agriculture and nature - forests, farms and animals who deserve to live in them. American suburban life or European small cities and their suburbs started looking evil and wasteful - more importantly unsustainable for the 21st century; and Tokyo (Japan) like lifestyle, while a little claustrophobic, started looking the most logical way we humans should imagine our future. However, my reverie has been broken recently - thanks to Elon Musk and his onslaught of energy efficient equipment from the Tesla car, to Tesla batteries - which allow suburban homes to survive off grid for weeks - to the most recent Solar Roof which promises to allow homes to completely disconnect from the grid!